Millions of people suffer from the painful and often debilitating effects of chronic inflammatory conditions such as rheumatoid and osteoarthritis, fibromyalgia, bursitis, tendinitis and carpel tunnel syndrome. Like many health conditions today, doctors are quick to prescribe conventional medications and drugs aimed to relieve the symptoms of pain, stiffness and swelling; but the side effects of these conventional drugs, including addiction, can outweigh the potential benefits. While many of these degenerative diseases cannot be cured, emu oil can dramatically improve the symptoms. Clinical studies have shown that Emu Oil applied topically has natural anti-inflammatory properties. One of the most impressive studies was one done by Drs. Whitehouse and Ghosh in Australia. Each of these clinicians has over 25 years of experience and have published extensively on the evaluation and development of drugs used for arthritis. Over a 14 day period they had 11 participants with chronic pain due to arthritis; joint swelling and bone abrasion apply straight emu oil to joints. The results were astounding. In 14 days, Emu Oil had eliminated all inflammation caused by arthritis joint swelling and bone abrasion due to lack of cartilage. None of the patients experienced arthritis pain in their joints and bones after 14 days of topical application. Emu Oil did not just mask pain, but reduced the inflammation which lowers the risk of further damage caused by scar tissue formation within the joints. Improved joint mobility can restore normal motion, translating to better performance during activities of daily life. For people with sensitive skin or allergies to menthol or capsicum we recommend massaging a small amount of Pure Emu Oil over sore joints and muscles at least two or three times per day, the effect seems to build between day 7 and 11, so stay with it. However, we have also found that when Emu Oil is combined with other anti-inflammatory and pain relief ingredients the results are even more powerful. Formulated emu pain relief creams, like our DuoFlex All Natural Topical Cream for Muscles and Joints, work in a twofold manner. Emu oil's strong trans-dermal abilities allow it to penetrate deep through multiple layers of skin, muscle and even cartilage while taking other encapsulated compounds along for the ride. This process has been coined by Doctors as "the emu oil express". First the mint or pepper plant derivatives work to quickly override nerve signals to the brain. The person will feel coolness or warmth as a mask instead of pain. This alone doesn't offer a long term solution to a chronic condition; but it feels better instantly and reminds one to reapply the cream a few times a day. Then the other ingredients like the emu oil, arnica, willow bark, witch-hazel, MSM etc. work to increase blood flow, so that toxins and waste materials can be removed from the site to reduce inflammation and swelling while providing nutrient materials and oxygen to encourage new healthy cell growth. The important thing to watch for is the Emu Oil content - some products have as little as 5% emu oil. Studies indicate that minimum 12-15% Emu Oil appears necessary to maintain the oils anti-inflammatory and trans-dermal properties. Additionally, for those with chronic inflammatory issues we recommend taking Emu Oil as a dietary supplement. A half a teaspoon daily can be mixed into food or your smoothie. It is not unpleasant tasting just a bit oily. Most people prefer to take Emu Oil encapsulated, as in our Duoflex Multi-Omega Gel Caps. Emu oil provides a blend of Omega 3, 6, 7 and 9 essential fatty acids plus 21 other bio-nutrients (vitamins, minerals, enzymes, etc) which have been proven to not only reduce inflammation but also greatly improve cholesterol levels, skin conditions and elevate mood and energy levels. 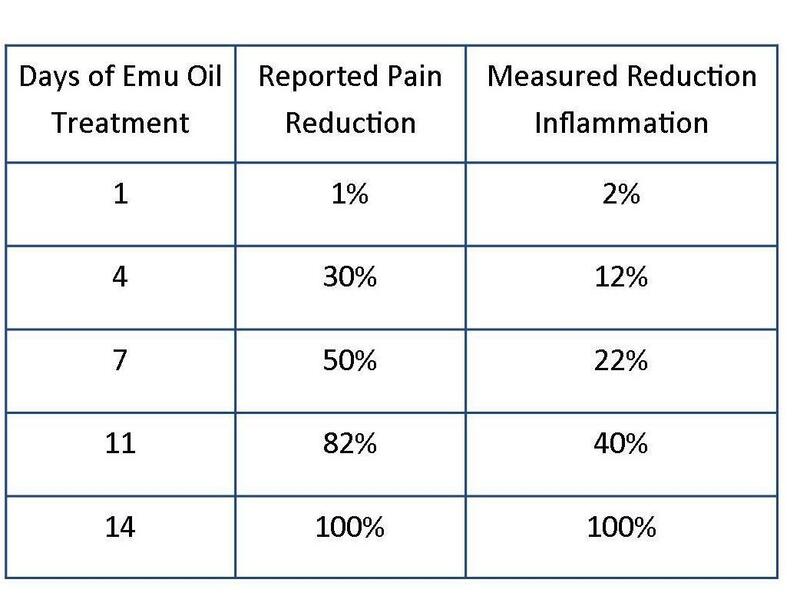 The anti-inflammatory properties of emu oil have been compared to those of Ibuprofen without the negative side-effects frequently common with non-steroidal anti-inflammatory drugs (NSAID) or corticosteroid based anti-inflammatory medications.